For the personal ordinariate of the Catholic Church, see Personal Ordinariate of the Chair of Saint Peter. The Chair of Saint Peter (Latin: Cathedra Petri), also known as the Throne of Saint Peter, is a relic conserved in St. Peter's Basilica in Vatican City, the sovereign enclave of the Pope inside Rome, Italy. The relic is a wooden throne that tradition claims the Apostle Saint Peter, the leader of the Early Christians in Rome and first Pope, used as Bishop of Rome. The relic is enclosed in a sculpted gilt bronze casing designed by Gian Lorenzo Bernini and executed between 1647 and 1653. In 2012, Pope Benedict XVI described the chair as "a symbol of the special mission of Peter and his Successors to tend Christ’s flock, keeping it united in faith and in charity." The wooden throne was a gift from Holy Roman Emperor Charles the Bald to Pope John VIII in 875. It has been studied many times over the years, the last being from 1968 to 1974, when it was last removed from the Bernini altar. That study concluded that it was not a double, but rather a single, chair with a covering and that no part of the chair dated earlier than the sixth century. The relic itself is described as an oaken chair damaged by cuts and worms. The Chair has metal rings attached to each side, allowing use as a sedia gestatoria. The back and front of the chair are trimmed with carved ivory. This description comes from 1867, when the relic was photographed and displayed for veneration. The reliquary, like many of the medieval period, takes the form of the relic it protects, i.e. the form of a chair. Symbolically, the chair Bernini designed had no earthly counterpart in actual contemporary furnishings. It is formed entirely of scrolling members, enclosing a coved panel where the upholstery pattern is rendered as a low relief of Christ instructing Peter to tend to His sheep. Large angelic figures flank an openwork panel beneath a highly realistic bronze seat cushion, vividly empty: the relic is encased within. The cathedra is lofted on splayed scrolling bars that appear to be effortlessly supported by four over-lifesize bronze Doctors of the Church: Western doctors Saint Ambrose and Saint Augustine of Hippo on the outsides, wearing miters, and Eastern doctors Saint John Chrysostom and Saint Athanasius on the insides, both bare-headed. The cathedra appears to hover over the altar in the basilica's apse, lit by a central tinted window through which light streams, illuminating the gilded glory of sunrays and sculpted clouds that surrounds the window. Like Bernini's Ecstasy of Saint Theresa, this is a definitive fusion of the Baroque arts, unifying sculpture and richly polychrome architecture and manipulating effects of light. Above, on the golden background of the frieze, is the Latin inscription: "O Pastor Ecclesiae, tu omnes Christi pascis agnos et oves" (O pastor of the Church, you feed all Christ's lambs and sheep). On the right is the same writing in Greek. Behind the altar is placed Bernini's monument enclosing the wooden chair, both of which are seen as symbolic of the authority of the Bishop of Rome as Vicar of Christ and successor of Saint Peter. 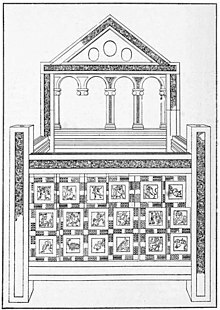 Early martyrologies indicate that two liturgical feasts were celebrated in Rome, centuries before the time of Charles the Bald, in honour of earlier chairs associated with Saint Peter, one of which was kept in the baptismal chapel of St. Peter's Basilica, the other at the catacomb of Priscilla. The dates of these celebrations were January 18 and February 22. No surviving chair has been identified with either of these chairs. The feasts thus became associated with an abstract understanding of the "Chair of Peter", which by synecdoche signifies the episcopal office of the Pope as Bishop of Rome, an office considered to have been first held by Saint Peter, and thus extended to the diocese, the See of Rome. Though both feasts were originally associated with Saint Peter's stay in Rome, the ninth-century form of the Martyrologium Hieronymianum associated the January 18 feast with his stay in Rome, and the February 22 feast with his stay at Antioch. The two feasts were included in the Tridentine Calendar with the rank of Double, which Pope Clement VIII raised in 1604 to the newly invented rank of Greater Double. In 1960 Pope John XXIII removed from the General Roman Calendar the January 18 feast of the Chair of Peter, along with seven other feast days that were second feasts of a single saint or mystery. The February 22 celebration became a Second-Class Feast. This calendar was incorporated in the 1962 Roman Missal of Pope John XXIII, whose continued use Pope Benedict XVI authorized under the conditions indicated in his motu proprio Summorum Pontificum. Those traditionalist Catholics who do not accept the changes made by Pope John XXIII continue to celebrate both feast days: "Saint Peter's Chair at Rome" on January 18 and the "Chair of Saint Peter at Antioch" on February 22. In the new classification introduced in 1969 the February 22 celebration appears in the Roman Calendar with the rank of Feast. ^ a b c "Interior of the Basilica". Vatican State. Retrieved 20 March 2013. ^ Akin, Jimmy (February 20, 2013). "9 things you need to know about the "Chair of St. Peter"". National Catholic Register. Retrieved 23 March 2016. ^ a b "The Chair of Peter". Catholic Exchange. Sophia Institute Press. February 22, 2016. Retrieved 23 March 2016. ^ a b "Catholic Encyclopedia: "Chair of Peter"". Retrieved 14 September 2014. ^ In late seventeenth-century Venice, Andrea Brustolon constructed a few grandiose armchairs that employ similar sculptural figures doing duty as front legs and armrest supports. ^ "The Tribune: Altar of the Chair of St. Peter". Retrieved 14 September 2014. ^ Variationes in Breviario et Missali Romano ad normam novi Codicis Rubricarum, I — Variationes in calendario, 8.